E System Sales, Inc is one of the Nations largest Retail Store Fixtures provider of Gondolas, Wire Displays, and Slatwall Panels. This versatile Madix four way Retail Store Display merchandiser display fixture shelf gives maximum exposure to impulse items. Panel frames are slotted to accept all Madix Standard Shelves or accessories. 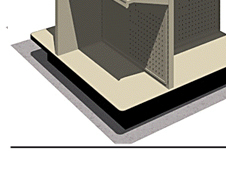 The Laminated or Carpeted Deck is 5" high, plus the deck has 'T' mold edge to match kick plate. Shelves not included. Square top cap between panels is the same finish as the panel frames. Unit ships assembled. 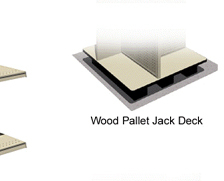 Add $107.95 for pallet jack kick plate and $239.10 for locking casters. Four way retail store display is a great store fixture designed especially to display all types of merchandise for all types of stores such as: Hardware Store, Clothing Store, Beauty Supply Store, Convenience Store, Retail Store, Grocery Store, Pet Store, Toy Store, and more. 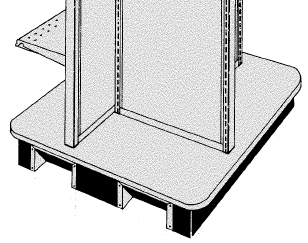 Maximum shelf depth is 12"
Total maximum load capacity is 1500 lbs. Based evenly distributes static load. Is this a great idea for movable displayers? The Quad Display features easy snap together assembly in a highly functional four way display witha range of available sizes. The perfect freestanding display solution for any space. 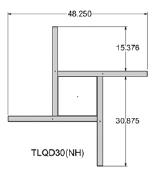 Unit ships unassembled and will accept both the Tube Line Upper Shelves [TLMS-(NW)(ND)] and the Madix Standard Upper Shelves [SUS-(NW)(ND)], sold separately. 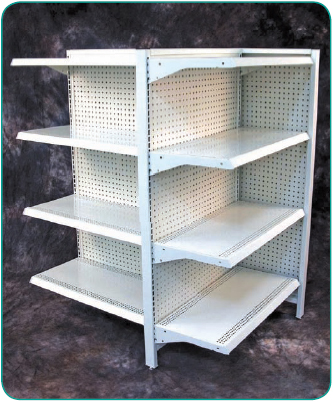 The unit can be ordered with either hardboard or pegboard backs. 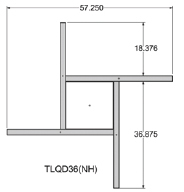 The 1" OC slotted frames include levelers. The Quad Display has a 1,500 lb. 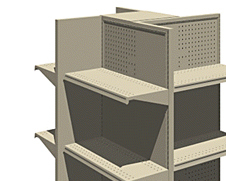 capacity based on an evenly distributed static load. 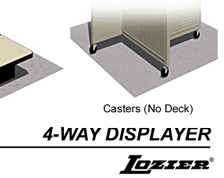 Width 48" 54" 60" 66" 72"
Three configurations available: wood base, wood base with pallet jack accessory, and with a caster wheel configuration, wood base edged with black T-molding, accepts all Lozier pegboard and slatwall accessories, slotted uprights accept all Lozier shelves and accessories.